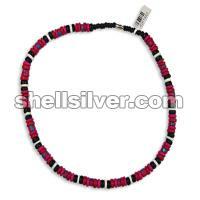 Necklace 18 inches in 8 mm coco pukalet black, fuchsia and red, 7-8 mm coco heishe fuchsia with splashing blue and 7-8 mm white shell heishe. 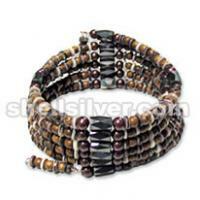 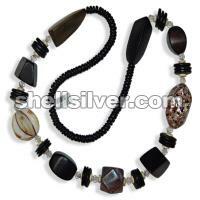 Necklace 25 inches in 8 mm wood beads black, 1 mm wax cord dark brown and off white, 20 mm coco pukalet black, wood twist 24x33 mm choco brown and dark brown and violet oyster twist 26x48 mm blocking inlay. 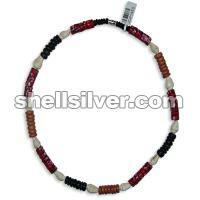 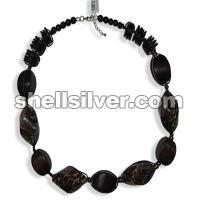 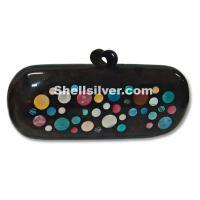 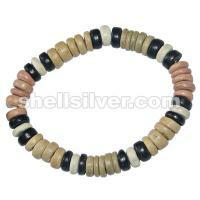 Necklace 18 inches in 7-8 mm coco heishe red with splashing, 8 mm coco pukalet black with splashing white and light brown and nasa shell white.